Thursday Night’s umpiring error by S Ravi, when he failed to spot a no ball off Lasith Malinga's bowling that allowed Mumbai Indians to sneak a win over Royal Challengers Bangalore, has yet again ignited a ferocious debate on the standard of umpiring on the Indian domestic circuit. It also raised a question that has come up quite often previously - Why are third umpires not being given the mandate to intervene when they have access to video footage and can rectify a mistake? Mumbai Indians captain Rohit Sharma in fact called for such a move in his post-game comments. The events that occurred in Bangalore generated a lot of discussion, but they are of course not an aberration. After 25 howlers in the 2017 edition of the tournament, the BCCI introduced DRS in the last IPL season. However while eradicating contentious decisions, the use of technology also highlighted the poor standard of umpiring on the Indian circuit. In the first nine games itself, as many as seven decisions were overturned with the help of DRS. A string of no-ball errors came to light last season - with Tom Curran and Andrew Tye being called out for overstepping in two separate matches, when TV replays showed that their foot had landed well within the line. Umpire Vineet Kulkarni last season refused to account a Shardul Thakur ball that was clearly above the waist of Kane Williamson as a free-hit. These instances only increased the calls for TV umpires to have the liberty to intervene and call out a no-ball (or overturn the wide as was the case in Bumrah’s case) even when the on-field umpires did not ask for a decision. With the Ranji Trophy, India’s premier First-Class competition, being marred by umpiring controversies repeatedly, poor umpiring standards is not a new conversation in Indian cricket. Some former umpires have criticised the BCCI for not conducting yearly medical examinations, while some have come down hard on the BCCI’s decision to distribute matches among lower-rung umpires as they demand a lower pay package when compared to the best available choices. At times, the BCCI needs to accommodate umpires from every zone, without knowing the standard of umpiring in the zone. An umpire officiating in the Ranji Trophy was quoted as saying that the hectic schedules without proper facilities hampers their decision-making. In 2017, on-field umpires Nitin Menon and C K Nandan failed to spot that David Warner had faced the last ball of the sixth over and then the first ball of the seventh against Mumbai Indians. There was another goof-up last year, when, the umpires failed to notice that Ben Laughlin bowled seven balls in the 12th over in the match between Rajasthan Royals and Sunrisers Hyderabad. Though currently a third umpire can only give his verdict when summoned, perhaps the need of the hour is to open up two-way communication, where the TV umpire can step in to prevent in such situations that will avoid in-your-face howlers. The problem isn’t restricted to India alone. 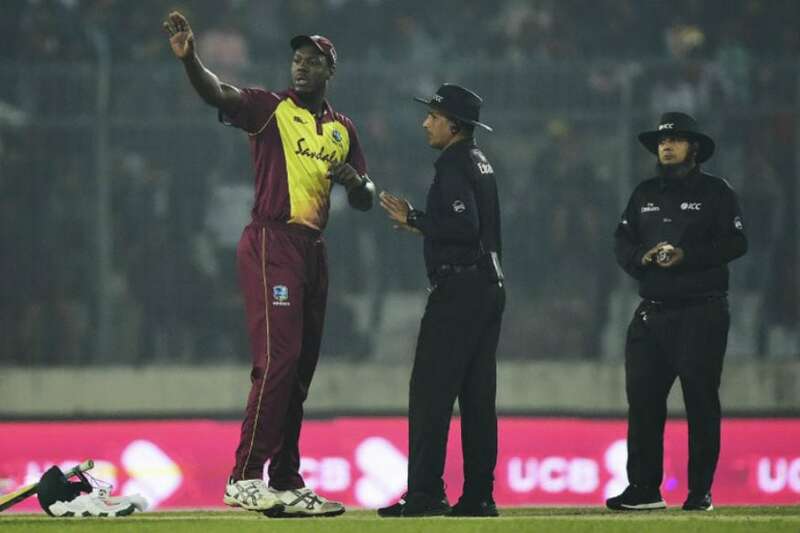 In the third T20I, a series decider between Bangladesh and West Indies last December, a controversial no-ball call by umpire Tanvir Ahmed marred proceedings. The umpire called out Oshane Thomas for overstepping in the fourth over of the innings. Replays later confirmed that Thomas had some part of his foot behind the line, which led to a lot of anger within the Windies camp. Though Carlos Braithwaite wanted to refer the decision, match referee Jeff Crowe turned down his appeal. Tanvir called another no-ball off Thomas erroneously, with both free-hits being sent over the ropes for a six. Though West Indies managed to win the game, Thakur’s no-ball that wasn’t called last year turned out to be the turning point as SRH lost the game by 4 runs. With T20 being a contest of small margins, glaring mistakes like these can often be the difference between wins and losses. With the on-field umpires asking for no-ball confirmation after a wicket has fallen, there seems to be no reason why they cannot go upstairs otherwise as well. The third umpire should perhaps have the mandate to immediately get back to the on-field umpires in case of an error. Footage of where the bowlers land after every delivery can be made available to the TV umpire, who can then convey the results to his on-field colleagues. As respected commentator Harsha Bhogle suggested, this ritual can go on in between deliveries, after the bowler has finished his delivery, so as to reduce time spent in watching and re-watching the video tapes. These measures will not only reduce the pressure on the on-field umpires, who, after watching their errors on the big screen can come under tremendous pressure for the remainder of the clash, but will also go a long way to ensure mistakes are kept at a minimum.